After breakfast we bid you farewell. We hope to welcome you again soon! Speyer - Speyer is a city known for its Cathedral where eight Roman Emperors and German Kings are interred. The Old Town Gate, Memorial Church, and Transportation Museum are all highlights of this beautiful city. Tonight, enjoy the Captain's Gala Dinner after your exciting day. 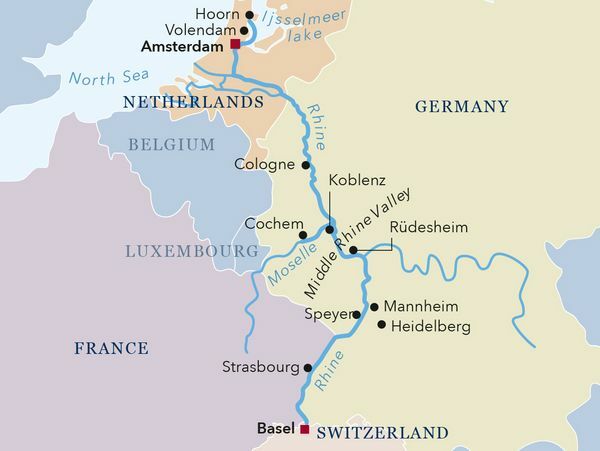 Rüdesheim - This afternoon, spend time on deck as we cruise the most beautiful section of the river- the legendary Upper Middle Rhine Valley. Late this afternoon, the vessel arrives in Rüdesheim, a winemaking town in the Rhine Gorge. Discover the region's rich history of winemaking- perhaps visit the local museum -a great place to start. Back onboard your crew awaits with a delicious dinner. Koblenz - This morning arrive in Koblenz, ideally situated at the confluence of the Rhine and the Moselle rivers. The Romans, the Franks, the Holy Roman Empire, the French, and the Germans have all had a hand in this strategic city's 2000 year history. St. Castor Basilica, the Church of our Beloved Lady, and the Emperor Kaiser Wilhelm's memorial at the German Corner, are just a few of the sites which reflect the history of the area. Cologne - After lunch, view our arrival into the beautiful city of Cologne. Every year visitors from all over the world are drawn to the historical city and its 2000-year history. Explore the historic Old Town, visit the famous twin-spired Cologne Cathedral, or perhaps sample some of the famous Kölsch beer brewed in Cologne. There are many medieval houses, bridges, and gates that will delight the historian in you, while the more modern skyscrapers that tower overhead are sure to impress. After an exciting day, we return to the vessel and make our way south. Hoorn - By lunchtime you will have crossed yet another country border to arrive in the Dutch town of Hoorn. This picturesque village is a jumping off point for the optional overland trip to the north of Holland and Amsterdam. For those remaining onboard, discover the beauty of the Dutch Watwerays as the ship glides toward the capital city of the Netherlands, where it will remain docked for the evening. Amsterdam, The Netherlands (Debark) - Amsterdam is a great city to discover the charms of northern Europe. The graceful canals of its central district are lined with beautiful gabled houses. It's many, grand art museums display masterpieces of Rembrandt and Vermeer and the largest collection of Van Gogh's work is found here. Fine food is also easy to find along with ample opportunities for shopping (including excellent vintage finds). This great city is well worth a day or two's stay after your cruise.